You know how you can be listening to a song for years and years and never hear things that someone else hears? That’s what’s so great about popular music, really. There’s a little something for everyone. 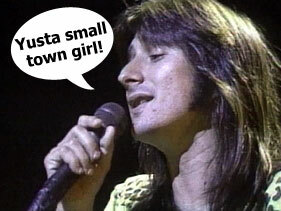 My bandmate Steve has brought something to my attention that I hadn’t ever realized/heard in the opening lines of one of my favorite songs, Don’t Stop Believin’ by Journey: Steve Perry does not sing “just a small town girl”, he actually sings “yusta small town girl”. IT’S A MOTHERFLIPPIN’ _Y_ SOUND, NOT A _J_ SOUND! So Steve’s theory about this is that Steve Perry did this on purpose to soften the J sound. I haven’t decided yet whether I agree with him on that, but I definitely hear the Y sound he’s talking about. S sounds, T sounds, P sounds ARE common problems for mics. I suppose it makes sense that sounds like CH and J would also cause problems too. But then again, we could all just be nuts. But now that I’ve heard “yusta”, I will never listen to that song the same again.